Three teenagers' quick thinking saved a dolphin calf who recently became stranded on an Australian lakeshore. 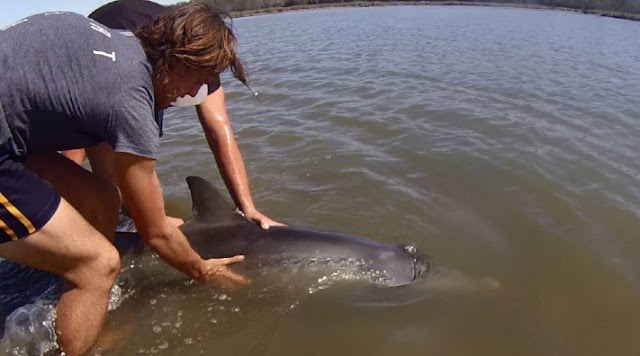 The teens, who filmed the experience, were kayaking on Goegrup Lake in Western Australia, when they noticed the dolphin, who had accidentally become beached in the shoreline waters and was struggling to stay alive. "We thought it was sick at first, so we got close to it and we saw the tide was going out and it was beached," one of the kayakers,15-year-old Zachary Allegretta, told Fairfax Media. ... but, eventually, he allowed the boys to turn him around and give him a gentle push. The process took around 30 minutes, the boys said. And you better believe that dolphin was out of there ASAP — likely headed toward the Indian Ocean, which is connected to Goegrup Lake by tributary. Responses to "Quick Thinking Teenagers Save a Stranded Baby Dolphin"